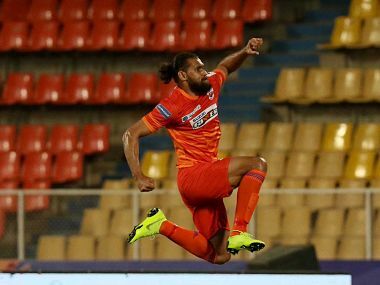 Pune: FC Pune City secured the bragging rights in the Maharashtra Derby after a 2-1 win over Mumbai City FC in their concluding match of this season's Indian Super League on Saturday. Adil Khan gave Pune the lead in the 18th minute before Iain Hume (84') scored the second to seal the result. Arnold Issoko's late penalty (90') only proved to be a consolation. The win sees Pune rise to sixth on the table with 22 points from 18 games. Mumbai had already confirmed the third spot in the league. Mumbai made a strong start to the game, threatening the Pune defence on multiple occasions. Paulo Machado hit the woodwork with a brilliant free-kick in the eighth minute before Issoko forced a save from the Pune goalkeeper Kamaljit Singh. But it were Pune who took the lead against the run of play in the 18th minute. Robin Singh, after being released by Hume, played a ball into the box where Adil found the net with a terrific overhead kick. Following the goal, Pune started to show much more confidence on the ball. Mumbai, meanwhile, were being restricted to half-chances. Just before the break, Pune could have doubled their lead when Robin got his head to a cross at the far post. His attempted header towards the near post was well saved by Mumbai custodian Amrinder Singh. Mumbai, who brought on Bipin Singh in place of Pranjal Bhumij, started with a lot of intent in the second half. Bipin unleashed a shot on target before Lucian Goian sent a header over after getting on to a cross from Machado. Bipin then lost the ball in an attempt to cut in from the left wing and the ball fell to Issoko who had the goal at his mercy. But his attempted chip over the goalkeeper went over the crossbar. Though Mumbai were looking to press the issue, Pune had a great chance when Hume's cross fell to Rohit Kumar. The midfielder tried to curl one into the top corner but was thwarted by a diving Amrinder. Mumbai upped the ante in search of an equaliser but Pune dealt them a killer blow with just six minutes of regulation time left. Mohammed Yasir cut a pass back for Hume after some good work and the former Kerala Blasters striker found the net with a first-time shot to notch his first goal of the season. There were a few nervy moments for Pune towards the end after they conceded a penalty in the 90th minute after Sarthak Golui was adjudged to have elbowed Goian inside the box. Issoko converted the spot-kick with ease but that was not enough to hand them a share of the spoils as Pune gained a measure of revenge for the defeat in the reverse fixture.